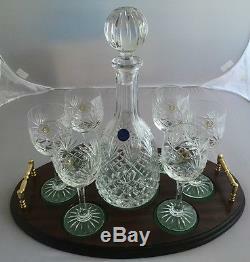 Wine Connoisseur's Vintage Wine Set Of Glasses And Decanter On Tray. Hand Cut 24% Lead Crystal Wine Decanter. Majestic 24% Lead Crystal Hand Cut 170g Small Wine/Port Glass (6). 450mm x 280mm x 63mm. 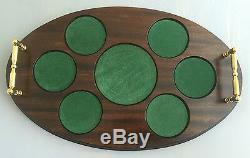 Mahogany veneered MDF tray with solid polished brass fittings and Green Baize Glass Sinkings and Underside. Ideal for the officers mess, Masonic, Rotary, Round Table or any function where Men gather and enjoy their vintage Wine and friendship. The item "Wine Connoisseur's Vintage Wine Set Of Glasses And Decanter On Tray" is in sale since Tuesday, February 23, 2016. This item is in the category "Pottery, Porcelain & Glass\Glass\Crystal/ Cut Glass\Crystal/ Cut Glass Objects\Decanters & Jugs". The seller is "cgbdiscountcentre" and is located in Wolverhampton, West Midlands. This item can be shipped to United Kingdom, Antigua and barbuda, Austria, Belgium, Bulgaria, Croatia, Cyprus, Czech republic, Denmark, Estonia, Finland, France, Germany, Greece, Hungary, Ireland, Italy, Latvia, Lithuania, Luxembourg, Malta, Netherlands, Poland, Portugal, Romania, Slovakia, Slovenia, Spain, Sweden, Australia, United States, Canada, Brazil, Japan, New Zealand, China, Israel, Hong Kong, Norway, Indonesia, Malaysia, Mexico, Singapore, South Korea, Switzerland, Taiwan, Thailand, Bangladesh, Belize, Bermuda, Bolivia, Barbados, Brunei darussalam, Cayman islands, Dominica, Ecuador, Egypt, Guernsey, Gibraltar, Guadeloupe, Grenada, French guiana, Iceland, Jersey, Jordan, Cambodia, Saint kitts and nevis, Saint lucia, Liechtenstein, Sri lanka, Macao, Monaco, Maldives, Montserrat, Martinique, Nicaragua, Oman, Pakistan, Peru, Paraguay, Reunion, Turks and caicos islands, Aruba, Saudi arabia, South africa, United arab emirates, Ukraine, Chile.